Beautiful felt ring arrives in the post! By the time you read this I will be part way through my two day workshop with Charlotte Buch at the ‘Felt Naturally’ symposium in Denmark! 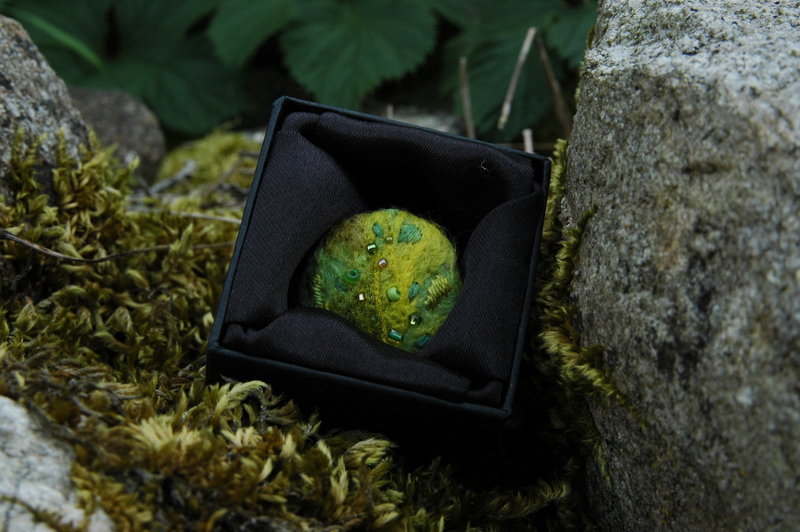 Last week I fell totally in love with a little ring created by Kate aka Tastykaeru and I was thrilled that it arrived in the post right on time to wear for my early morning departure to Grima’s exciting felting get together. Opening the package just confirms my thoughts that judicious beading and stitching can really add another dimension to hand rolled felt. Kate’s Etsy shop is a pleasure to browse through, jam packed with gorgeous but simple embellished jewellery and at such amazing prices it is difficult to decide where to start! Green being my FAVOURITE colour to wear for the last few seasons I finally decided to break the bank and buy this little beauty!!! Yesterday afternoon as I was trying to tidy my studio (yes, I can NEVER keep it in order!) I came across another small scrap of discarded knitting or possibly even crochet. I don’t have any idea what I was doing or when I started and scrapped it but I do know that the yarn was a gorgeous merino and silk combination from Manos del Uruguay in lovely shades of blue and green. I decided to felt a small insulated pot stand using two shades of green and a white C1 wool and stretch out the knitting for some surface interest. Again this yarn combined very well with the fibre but if I were to start over I would probably try getting the base to the prefelt stage before adding the yarn because it did lose some clarity and sharpness of colour as the felting process progressed. My mother called over for a coffee earlier this morning and while we were having a chat the postman arrived with my large order of wool from Iceland. At last I can start to get Sylvia’s rug underway but now I am thinking I am not going to get it finished before I head off to the ‘Felt Naturaly’ symposium in Denmark next week, never mind I will finish it in a couple of days after I return home. I am going to finish tidying the studio this afternoon and hopefully get the rug base laid out ready for long days felting on Friday, Saturday and Sunday. Tomorrow I will be at a Visiting Captain’s Day at Killerig Golf Club but all work and no play …………. 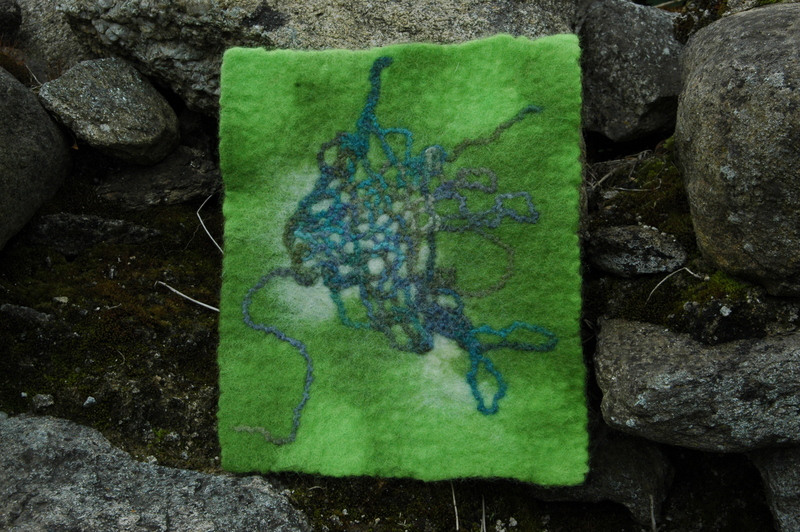 not that I ever look on felting as work but you know what I mean! 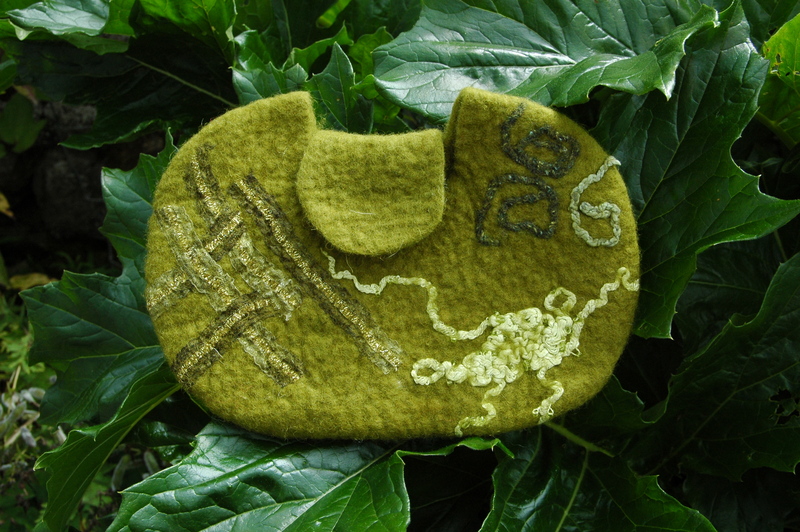 ‘Felt a small clutch bag’ workshop at Clasheen on 5th August and huge internet problems over the last few days! 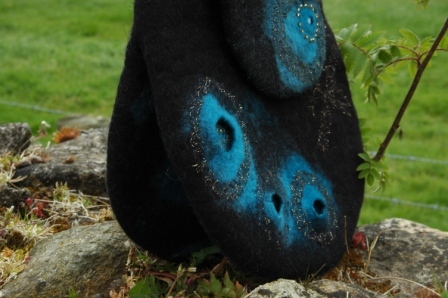 I had been planning a simple felt vessel workshop for the afternoon of Thursday 5th August but since Kristi (who will be visiting from America!) really likes the little clutch bag I blogged about on Friday have decided that this is what we will be felting instead!!! If anyone is interested in joining us we will be starting at 14.00 sharp and working until between 16.00 and 16.30. Basic experience is necessary for this afternoon workshop and the cost will be E25 incl. materials. If anyone has no previous felting experience or is just starting out I am happy to offer the same workshop on another date but taking 3 to 3.5 hours, the cost for this longer session would be E35 incl. materials. Please email me asap if you would like to reserve a place on 5th or are interested in another date and time. Our weather has deterioriated really badly over the last few days, wet, wild and windy! I think that this must be the reason my internet connection has been and still is appalling. Please forgive me if you have been trying to contact me via email or are waiting for a response to anything, I hope all will be back to speed later today or by the middle of the week in the worst case scenario. Beautiful beaded silk felts perfectly! One very welcome spin off from my recent adventures in freestyle knitting has been discovering some of the amazing natural and man made yarns now available online or in specialist shops. I felted myself a little clutch bag (purse for our American friends!) on Thursday afternoon and decided to add various yarns from my Blade scarf into the surface layer as an experiment to see how they would felt. The most amazing revelation was the huge success of some Tilli Tomas beaded silk! This is a very beautiful but expensive yarn and I had a small bit of discarded knitting with some cut threads which I really didn’t know if it would be possible to incorporate successfully into my felt. I laid out the bag around a resist as normal, decorated the surface with the scrap of beaded silk knitting, some artificial sari ribbon and some swirls of a Rowan wool/silk yarn and a silk/cotton combination. Some of the beaded silk I covered with the finest wisps of fibre and other areas I left uncovered. 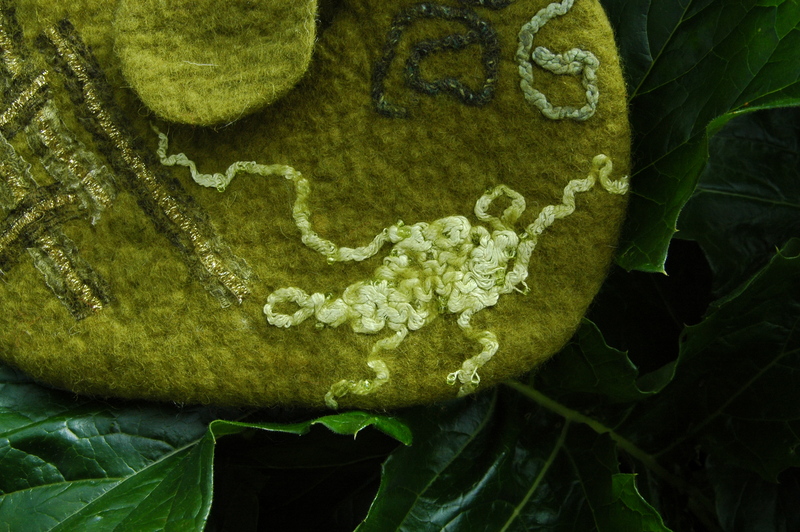 I needn’t have worried, the beaded silk felted beautifully and actually needed no covering wisps at all. I love the way the knitting has become distorted and the little seed beads gleam and glisten as they catch the light! The sari ribbon also became incorporated really easily and it was actually the silk/wool and silk/cotton combinations that needed a little extra care while rubbing before they felted fully into the wool. I love the effect of all the different yarns in the finished bag and know that it will get lots of use over the coming months, green is after all the colour that I am most often to be seen wearing! Felt flowers adorn my garden! 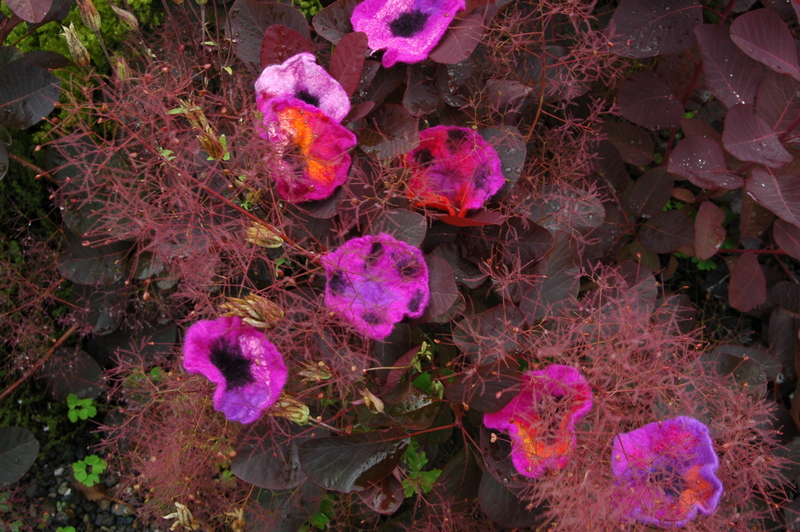 This morning I finished the last of the 36 felt flowers for my sister’s lamp and as the latest batch are drying on the range I thought it would be fun to take a picture of some scattered amongst the leaves of my beautiful purple burning bush! 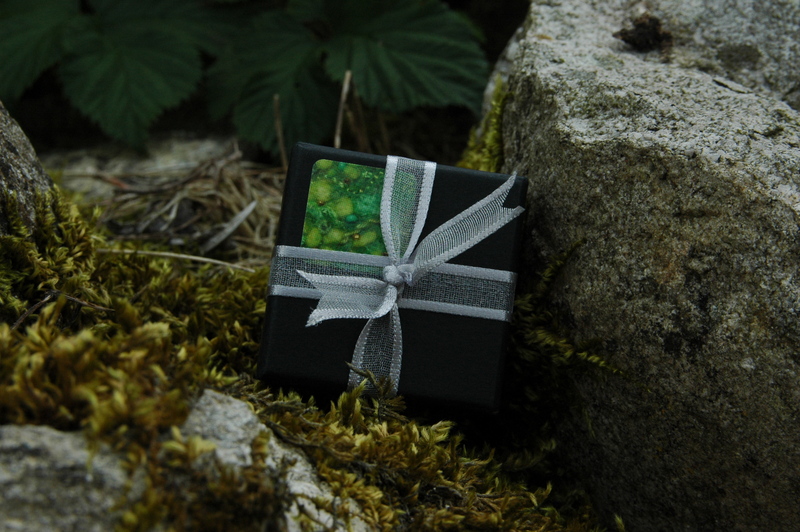 I didn’t find the flowers as tedious to felt as I had been expecting. Maybe it was the fact that I was only working on 36 and not 450 as previously for Sculpture in Context but anyway I enjoyed playing around with the colours and I hope that Suzanne will be happy with the result. This afternoon I am intending on punching a very small hole in the centre of each flower then unscrew the bulbs and refit them around the felt. I am consistently amazed at how versatile and wondrous a fabric felt is, the fact that wool is fire resistant means that these little lamp shades will be perfectly safe. When the lamp is fully assembled I promise to take some pictures before it wends its way to Suzanne in Dublin!